PARK CITY Triblavina is potentially one of the greatest development project in Central Europe. The largest compact and settled location is situated in the attractive development corridor of the capital city of Slovakia, Bratislava. It has the dynamic potential to become a project of the City of the Future. Number of inhabitants: 5.4 mil. In the middle of a busy, dynamic happening in the centre of Central Europe, in a climatically moderate environment with a wealth of potable water, green nature, and on the banks of the second largest European river, the Danube, lies the capital city of Slovakia, Bratislava – heart of Central Europe. Although Bratislava is a historical coronation town, today it is also a modern city with excellent growth potential. 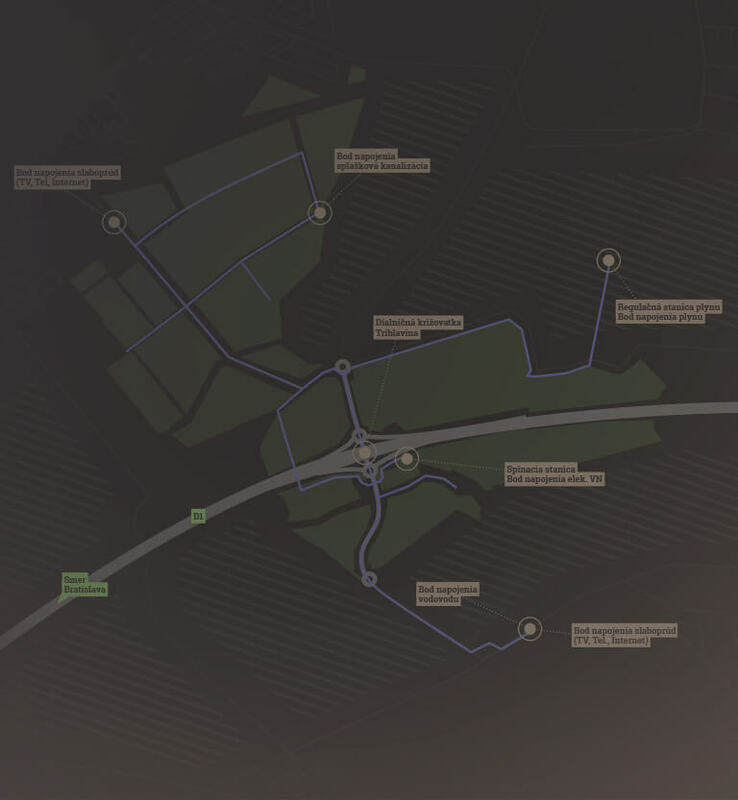 It is the economic, scientific, research, industrial, social, and political centre of Slovakia with a direct connection to Central European transport networks – airport, railway, naval, as well as highway networks. Bratislava is a developed European metropolis. It is a city of many faces, pleasant fragrances, and varied cuisine. The abundant cultural and social life of the city is supplemented with excellent opportunities to spend free time in surrounding areas. Those who fancy high-bred horses, golf, water sports, or fabulous wines, as well as friends of opera, jazz, or the fine arts can enjoy their time here. The location Triblavina offers space for ecological projects, the construction of research and development centres, logistics parks, strategically located services and civic amenities, university premises, office premises of the 21st century, or revolutionary accommodation for people who care about the meaningful use of the environment with an emphasis on sustainable development. The property has been settled, consolidated and defined as a development area in zoning plans. With its area and majesty within Europe, Triblavina is a unique location which is prepared for unique investment from the perspective of legislation as well as infrastructure. The property is not encumbered in any way. Investors can immediately start carrying out their projects at this location. The most significant traffic artery of Slovakia crosses the territory of Triblavina. The most frequented D1 highway together with D4 highway (under construction) offer an ideal connection to the capital city, and all important domestic as well as international traffic routes. Cadastre area: Chorvátsky Grob (157.88 ha), Bernolákovo (127.61 ha), District of Senec, Bratislava Region. I) Mixed-use area of civic amenities, production,and non-production services. 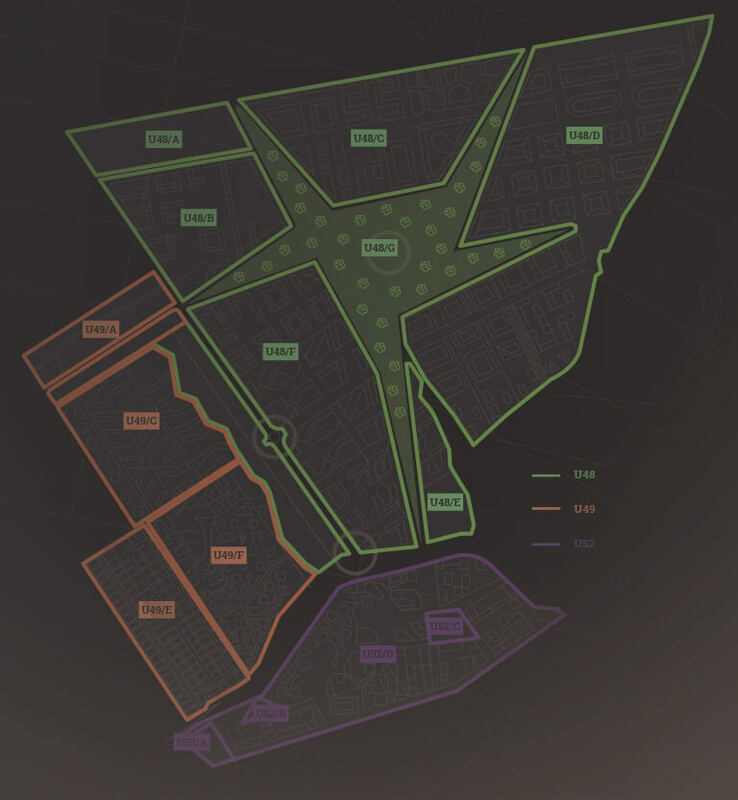 II) Mixed-use area of residence and civic amenities. Project success on such a promising location like Triblavina depends on the quality of prepared technical infrastructure and utilities. We have thought of future development and we count on the needs and possibilities that the location offers. All of the building permits and water-right permits for utilities for the location Triblavina have been issued. Supply is resolved with sufficient capacity of the local distribution network, calculated for supplying the entire location and all properties within the area. Traffic connection to the area in the ownership of Starland Holding a.s. is prepared by means of the highway intersection of D1-Triblavina. HV:HV is fed into the territory and by means of sectioning point HV performance is distributed using cables into individual objects. To- tal maximum potential capacity of HV feed point is 20 MW. The structure is a multi level interchanges on highway D1 (18,080 km) in the section Bratislava – Senec. 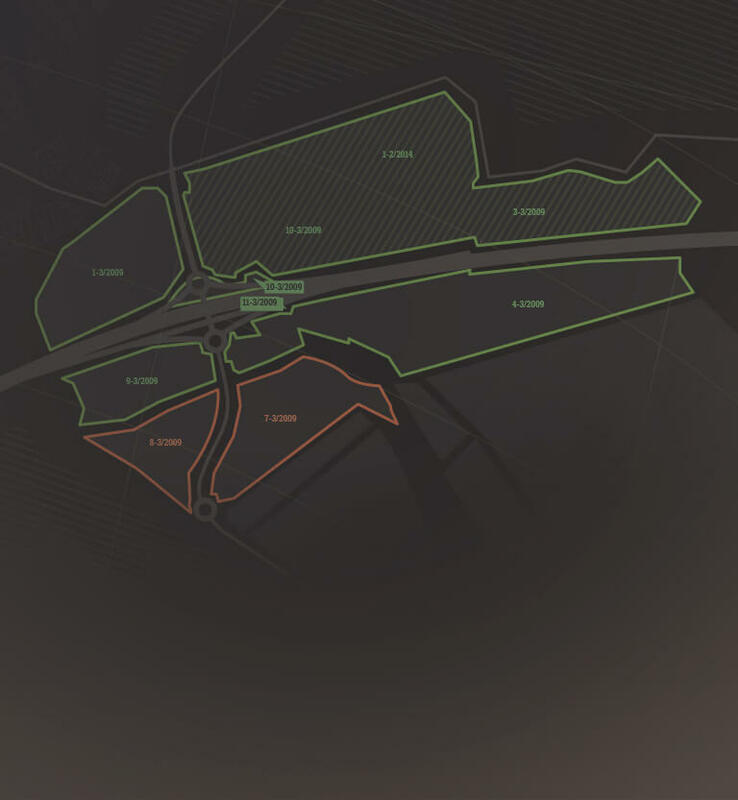 The structure belongs to the extension of the project to the D1 motorway Bratislava – Trnava. 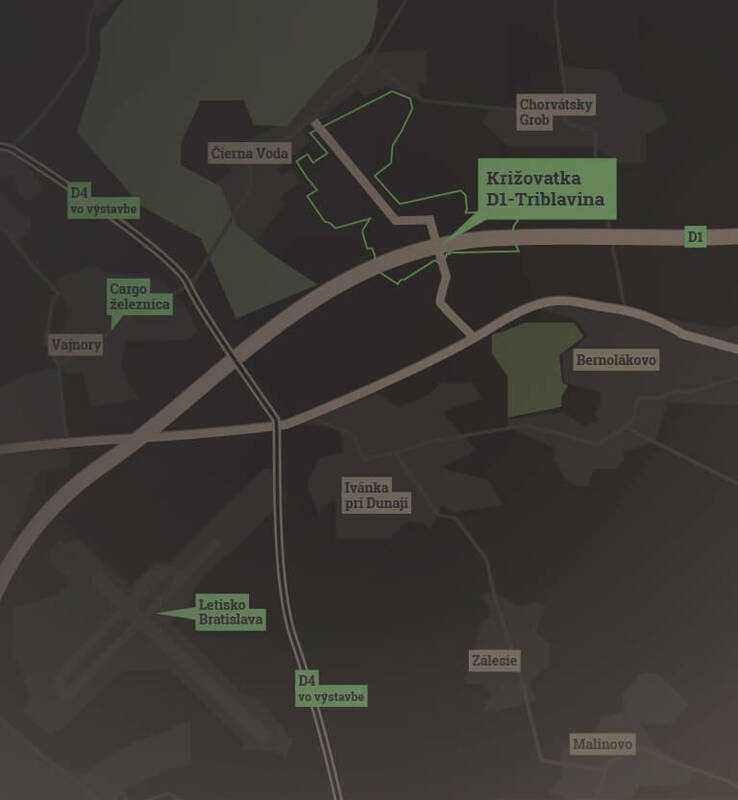 PARK CITY Triblavina will grow in sight of one of the greatest Central European commercial and business zones, constituting the north-eastern part of the city between the historical centre of Bratislava and the international airport of M.R. Štefánik (Avion Shopping Park, Galvaniho Business Centre, Korzo, Pharos Park, Shopping Palace). 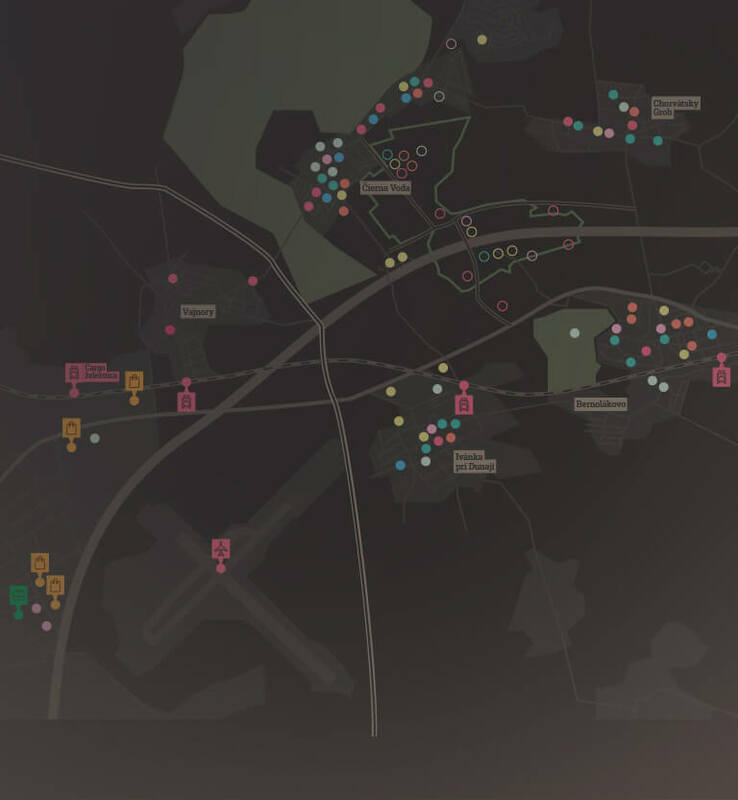 In the close vicinity of the newly-growing zone, surrounding municipalities have civic amenities, services, shops, restaurants and possibilities for spending free time, engaging in sports or relaxing in the popular relaxation zone of Zlaté Piesky. Mixed-use with town structure predominantly with area of civic amenities, low rise residential, residential and recreation, including transportation, infrastructure and landscape. Mixed-use with town structure predominantly with area of civic amenities, residential and recreation, including transportation, infrastructure and landscape. Mixed-use with town structure predominantly with area of civic amenities, transportation, infrastructure and landscape. 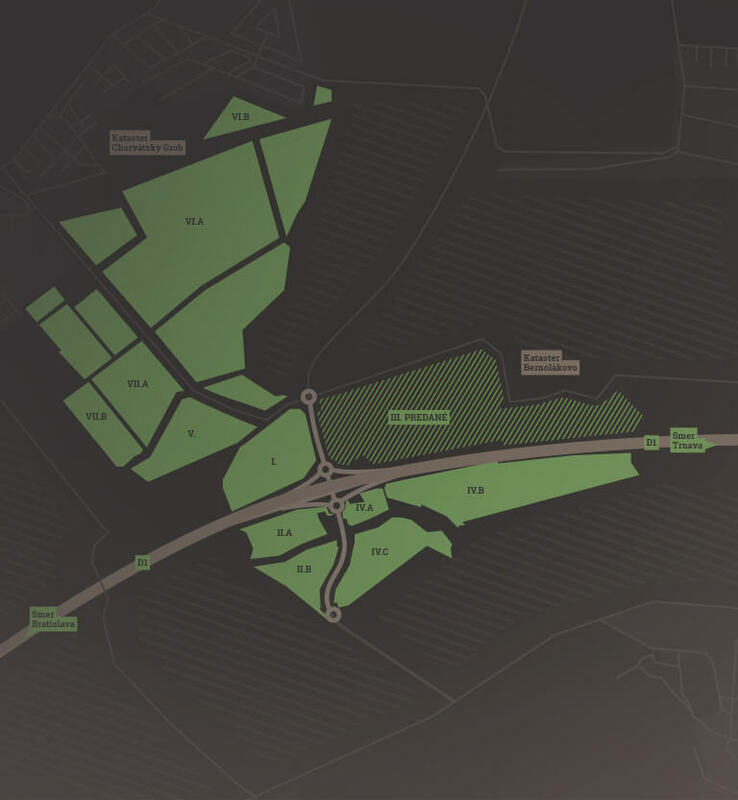 It is rare to have such a huge area available for development and investment that is consolidated, with excellent infrastructure, and an exceptional location. Our goal is to stand at the origination of a zone with established innovations, non-traditional solutions that will be in line with sustainable development, and an ecological approach to accom- modation and living. It is exciting to be at the start. Thanks to its extraordinary infrastructure, excellent layout, plenty of green areas, and excellent accessibility, Triblavina could be a space for a futuristic solution of new urbanism or ecological housing, science and research projects, quality education, logistics, the sophisticated industry of information technologies, or major cultural and social projects. 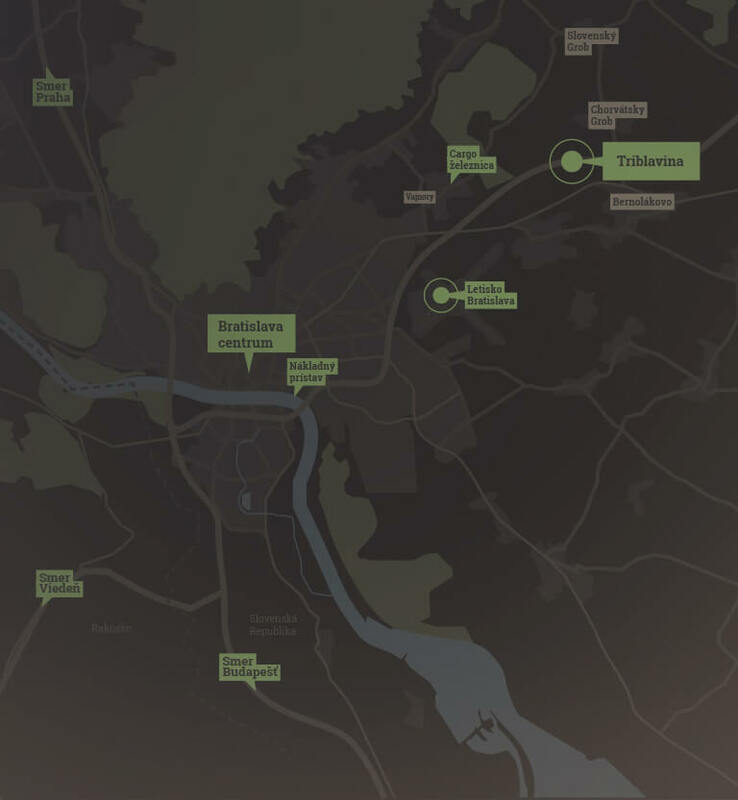 At present, the Company primarily focuses on the development of the largest project in the region of Central Europe located at Triblavina next to the capital city Bratislava, that has the ambition to become a pilot project in terms of architecture, ecology, science and research, informatics and new urbanism for residential. Building of a strong development company with a focus on the Slovak market with a significant share in the market of commercial and residential properties in the Bratislava region. name and address:Starland Holding a.s.